The Tokyu Hospital building in Ookayama is truly stunning. I blogged about it last fall, when I noticed that the Tokyu rail/construction/retail conglomerate was advertising “we do eco” in the Tokyo Metro. Seeing the hospital in person exceeded my expectations: a huge building on top of a rail station and enveloped in plant life that will only become more attractive over time as the plants mature. In addition to the two large facades with vines climbing the height of the building on tension wires, another side has deep balconies that are lushly planted. The landscape is meant to promote healing for the patients who can see and access the balconies from their rooms. I imagine it is also calming for visitors and workers, plus it makes an amazing contribution to the neighborhood and all the people using the rail station. I would love to see the landscape from the inside of the hospital, and to learn more about the plant selection of this fantastic vertical garden. Between reading about this project and seeing it recently, I was also very fortunate to meet Tokyu Hospital’s landscape designer, Hiraga Tatsuya (平賀 達也). After working at Japan’s largest architecture firm Nikken Sekkei, designers of Tokyo’s new Sky Tree, Hiraga-san now runs his own successful landscape architecture firm called Landscape Plus. Alongside institutional and private projects, Hiraga-san contributed to Ando Tadao’s master plan calling for a new Sea Forest in Tokyo Bay (Umi no Mori or 海の森) linked to a network of old and new green spaces that would improve wind circulation throughout Tokyo. This was part of Tokyo’s failed bid for the 2016 Olympics. Speaking with Hiraga-san, I was very impressed by his vision that an individual site design’s performance and aesthetics are improved when it responds to its context. Hiraga-san also told me about his love for Tokyo’s hills and soil. It seems very courageous that he has created his own practice despite the poor economy for architects in general, and also Japan’s still limited understanding of the value of landscape architecture. I wish him great success, since I am certain that Tokyo as a city will continue to benefit from his projects. An interesting video from CNN about one Kawasaki family’s choices in constructing a house with minimal environmental impact: passive daytime lighting, low flow faucets, double paned windows, solar water heater, and a roof garden for cooling the home and providing vegetables. 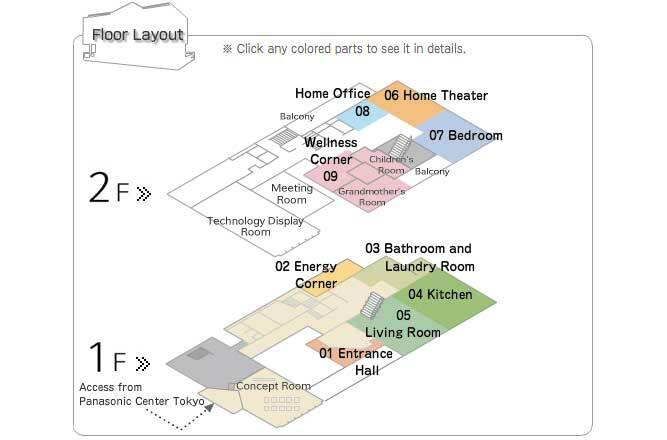 There is also discussion of Panasonic’s Eco Idea House with an energy management network and fuel cells. 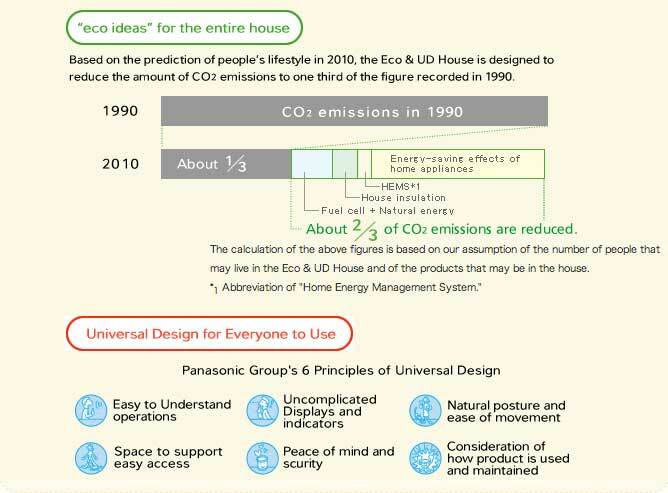 Panasonic projects a 66% reduction in carbon emission levels from 1990 to 2010 in the house of the future. And it also envisions “universal design” principles to allow for optimal usage by the elderly and disabled.